President Muhammadu Buhari has on Friday, November 10, met with Muslim leaders across the nation at the Presidential Villa in Abuja. 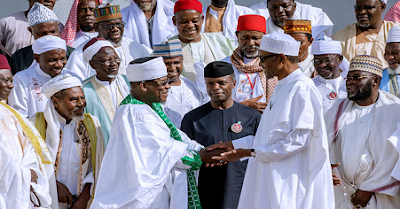 The Muslim leaders including Jama’atul Nasril Islam group during the meeting prayed for the good health of the president and also called him to maintain good governance and ensure just amongst all groups. Muslim leaders at the meeting include Secretary General JNI, Dr Khalid Aliyu, National Chairman JIBWIS, Sheikh Bala Lauw, Ibrahim Bauchi, Sheikh Muhammad Jingir and Sheikh Qaribullah, among others. President Buhari met with leaders at the Presidential Villa, Abuja, on Friday after an earlier meeting with Christian Association of Nigeria (CAN). The Christian leaders during the meeting demanded Nigeria’s exit from all religious organisations. CAN President, Reverend Ayokunle at the meeting also asked the Federal Government to tackle herdsmen attacks in the country.